Every once in a while, you need a break. A break from work, a break from school, a break from life, a break from family (No, I'm not talking about mid-life crisis-like breaks. Just little breaks). Many people feel like the weekend is a great time to take a break. Others feel like the halfway point in the week, Wednesday (or Hump Day), is the best time to take a break. I say: Why not have both? On Wednesday I took the day off and went skiing at Brian Head with my friends Michael S. and Meckenzie S. Meckenzie scored a sa-weet deal on lift passes ($10!) and I rented my equipment from Sports Authority (saved about $2 vs renting from Brian Head). We spent the day at Giant Steps and had a blast! Michael and Meckenzie are snowboarders and I am a skier, but we made it work. We did some sick jumps (ha- I didn't. Big air kind of terrifies me...), moguls, and races down runs. Me chillin' on the slopes. There was one epic race that I need to tell you about. The race was down Giant Steps: a run that is almost one mile long fraught with moguls, powder, ice, and steep slopes. The stakes: bragging rights for the win. I wasn't going to play mister nice guy and not use my skier advantage (e.g. poles) and I had a good lead for 2/3 of the run. We were flying down the mountain! I was trying not to turn to slow down and it got scary at times because of the high velocity speeds. But these speeds didn't last forever. There are two large spots of moguls. These moguls were covered with crud (crud is powder that’s been skied over. It looks like cookie dough; it's chunky looking, but still soft. Crud is a preferred snow texture. Source). And I fell. About four times. One time I managed to fall with my skies crossed, looking up the mountain and I could see Michael above me, crashing down the mountain in clouds of snow. He passed me! There wasn't much of the moguls left, so I got untangled (fell once more), and then went straight down, no turning, over the remaining moguls and hit the groomed trail. I'm surprised at how fast snowboards are. My legs were shaking from exhaustion at this point. I couldn't catch Michael. He beat me by 1.09 seconds. We collapsed at the end. People smoking and the whole parking lot smelling like pot. When we walked into the lodge for lunch, there was a man who was freaking out. Turns out he was recovering from a seizure. Scary. Got slightly sunburned on the right side of my face. Explanation: riding up the lifts take longer than going down the mountain and the sun was to the right when you go up the mountain. Pillows isn't as fun as I remember it (that was my favorite trail when I was an avid skier back in the day). You use a lot of different muscles than you usually do. I'm still a wee bit sore. Michael and I decided that the party wasn't going to end just after skiing, so we went to Pizza Hut, Sweet Mercy cupcakery, and Crave FroYo (the latter two we visited while our pizza was cooking. We sampled froyo and actually purchased 2 cupcakes. Yummy!). Then we went to my house and watched Inception. Pizza, cupcakes, cheesy bread, movie. So good. Because of this amazing ski trip, I got behind in my English class and am stressed because of it. I never want to miss another day of English again. That is why my hump day will be on Thursday from now on (English is on MWF). 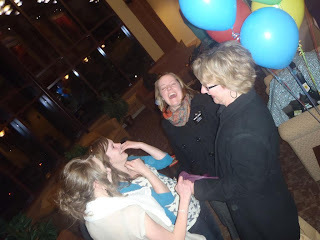 Friday: Isie came home from her mission in Boston! It was late at night (her flight plans changed) but I am so happy that she's home! Elise B. (the other part of our trio from high school) came down from Provo area with Isie's sister, Venice, and Venice's friend Forest. We made posters (mine was pretty much the best poster I have ever made... I don't have a picture of it. I'll get one later), and got her some Boston Baked Beans, and tapioca pudding (her favorite). We went to the airport and were hysterical because of the great anticipation. There was another missionary family at the airport. They were very composed and calm. We were not. The "Welcome Home Isie" committee with their noses pressed against the panes in search for her plane. Forest is dancing the Safety Dance to stay calm, cool, and collected. Isie's family (aka: my other family) LtoR: Grandma June, Venice, Isie, Colleen, Sage, and Pat. Laughter! I think Isie was freaking out about how different Sage looks. On Saturday Isie taught us how to make pupusas (she served the Spanish speaking people of Boston) and we ate those and tacos. Nom nom nom. Today, Sunday, Isie spoke in church and did a great job. Following sacrament meeting, I went to Grandma June's house with Isie's family and enjoyed lunch, music, company, and "my other family." I love them! Tuesday Taco Party! Elder and Sister Bingham started this great tradition of Taco Party the night before transfers. Elder and Sister Bushman continued the great tradition. The food isn't usually tacos. I think this night we had falafels. LtoR Elders Matthew P, me, Taylor T, Bushman, Sister Bushman, Elders Tucker C, Eric M, Brian H, Travis G. Taking the picture is Elder Tyson W.
You only saved about $2 renting at SA instead of Brian Head?